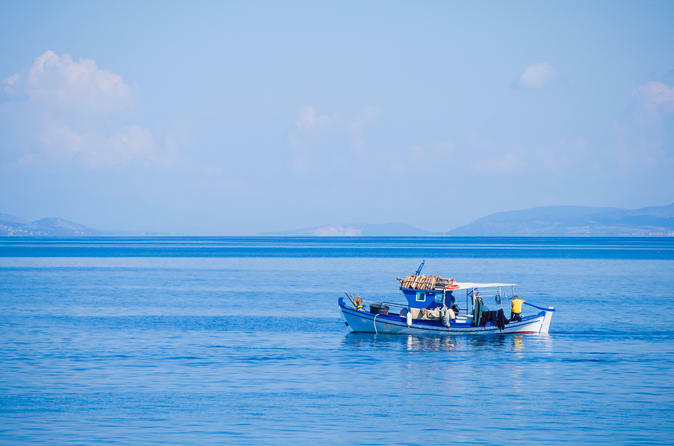 Discover the secrets of the deep blue Aegean on this half-day fishing tour in Santorini. Head out to sea on a traditional fishing boat with local fishermen, who will show you tricks of the trade passed down through generations. See how the fresh catch of the day is brought up, and try your hand at this ancient Greek sport with provided equipment. Taste the ocean’s bounty with a fresh seafood lunch, and cool off with swimming and snorkeling stops at the island’s Red Beach and Akrotiri caves. Climb aboard a traditional fishing vessel at Santorini’s Vylchada port, and head out into the wild sea with your crew for the day — fisherman with deep working knowledge the local fishing industry. Begin the day with a stop at the island’s distinctive Red Beach to swim and snorkel among the rust-colored sand, framed by dramatic black mountain cliffs. Drop anchor and enjoy the chance to cool off again at a stop near the Akrotiri caves. Watch how your expert guides pull up shrimp traps and fishing nets laden with the bounty of the Aegean. Give it a go yourself with provided fishing rods and bait, picking up a few tricks of the trade from your crew. Finally, feast on the fresh catch of the day, prepared by the crew using traditional methods. Enjoy a unique perspective on Santorini as you make your way back toward the port, where the 5-hour tour concludes.